Copyright © Tim Anderson (dv over dt) on Flickr. All rights reserved. 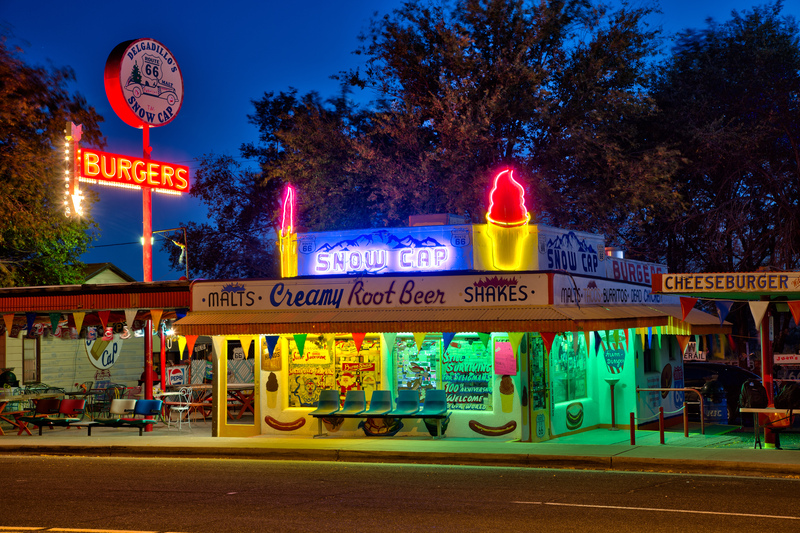 If only one business or attraction could be selected as being most important in having "saved" old U.S. Route 66 and made it the tourist destination it is today, I’m confident it’s Delgadillo’s Snow Cap Drive-In. One of the great disappointments of my big 2007 road trip where I traveled about two-thirds of The Mother Road is that I arrived in Seligman too early in the day for this place to be open. Posted in Retro/Vintage, signTagged Americana, dusk, neon, nostalgia, photography, restaurant, twilightBookmark the permalink. Notes from the PD No. 1 – We’ll Cut Them Off at the Pass! Listen to KoHoSo Radio 66!